You’ve probably noticed that interior decorating magazines and social media feeds are full of beautiful, wood kitchen cabinets. In fact, a lot of people stain natural wood when it comes to the cabinet refinishing portion of their kitchen remodel. So what makes stained wooden cabinets so popular? As opposed to a solid colored cabinet, stained wood cabinets break up the monotony in a kitchen by adding dimension and texture. Cabinet refinishing or staining maintains the integrity of the wood’s natural grain and character—providing a look that is unique and can’t be replicated. Staining kitchen cabinets are significantly less expensive than painting them. Stained cabinets appear cleaner because they hide everyday chips, scratches, and smudges better than a painted cabinet. Stained cabinets are a timeless choice. They pair well with just about any decor and will continue to be in style for years to come. 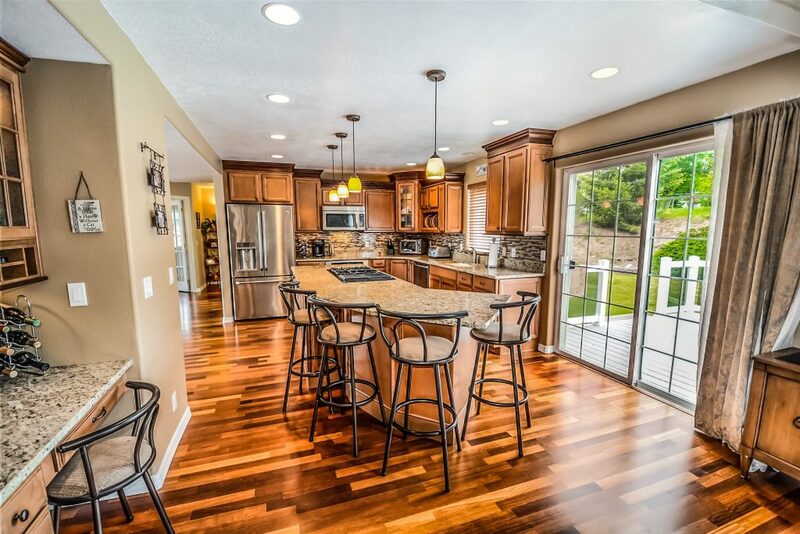 If you want a new stain for your kitchen cabinets, WoodWorks Refurbishing has you covered throughout the northern Utah area. Contact us today to get started on your next cabinet refinishing project! This entry was posted in Kitchen, Refinishing, WoodWorks. Bookmark the permalink.